Questions are posed using Promethean Board software, which has been installed in MCPS classrooms throughout the county. Each contestant chooses a virtual envelope that will appear on the Promethean Board screen. Within the envelope, six questions will be categorized as Hard, Harder, and Hardest. There will be two questions in each category. The contestant will “win money” for each correct answer. The money won will be granted by the Montgomery County Public Schools Educational Foundation to highly impacted MCPS elementary schools. After the question is read, each fifth grade team will confer and lock in an answer. The contestant will be asked for his or her answer. The students’ answers then will be revealed. The Teacher of the Class will ask a student team to discuss how they selected their answer. 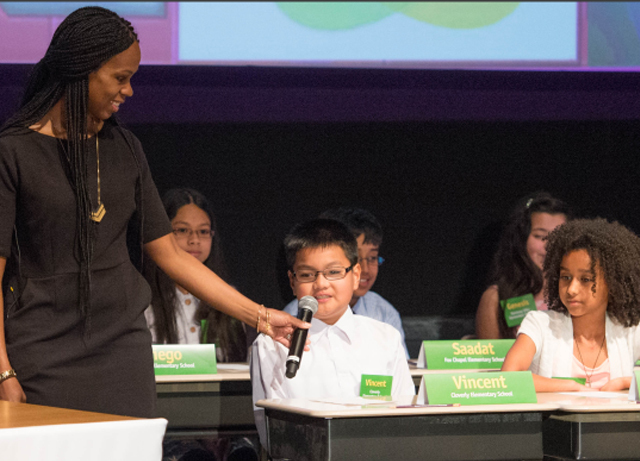 If the contestant answered differently, he or she will have the option to switch to the fifth-graders’ answer or stay with his or her own answer. The correct answer will then be revealed. Thirty (30) seconds will be allotted to answer questions in the Hard category; each correct answer will win $100. A wrong answer wins no money. Thirty (30) seconds will be allotted to answer questions in the Harder category; and each correct answer will win $400. A wrong answer wins no money, but there is no penalty that will reduce the amount of money the contestant already has won. Forty-Five (45) seconds will be allotted to answer the first question in the Hardest category; and a correct answer will win $1000. A wrong answer wins no money, but there is no penalty that will reduce the amount of money the contestant already has won.